Our Lady of Lourdes has several active book clubs. Books are selected by the individual groups and scheduled to be read on a monthly basis. A wide variety of books are chosen: religious, novels, fiction, historical fiction, biographies, and current best sellers. A group discussion is held on the subject book at each meeting. We meet once a month at 7:00 on a Monday evening for approximately 2-1/2 hours. This includes prayer, discussion of the book and social time. At each meeting we determine which Monday we will meet for the next month. Generally we meet at Ray & Karen Brown’s except in winter when we meet at member’s homes in town. Our books are chosen by the group once a year from a list that we gather throughout the year. We read spiritual/inspirational, historic novels, fiction, and non-fiction/memoirs. We are made up of a variety of people of different ages, diverse backgrounds and a variety of interests. We are men & women, single and married. An Afternoon Group is held on the third Monday of each month, hosted by a group member. The group meets at 1:00 p.m. during the months of September through June. Lunch prior to the meeting is scheduled in September, December, and May. Contact Kathy Draves for more information at 920-425-3660 or kathydraves@gmail.com. An Evening Group is held on the third Monday of each month, again hosted by a group member. This group meets at 6:00 p.m. with dinner at 6:15 p.m. during the months of September through June. Contact Chris Schmidt for more information at 920-336-3992 or majik4654@gmail.com. 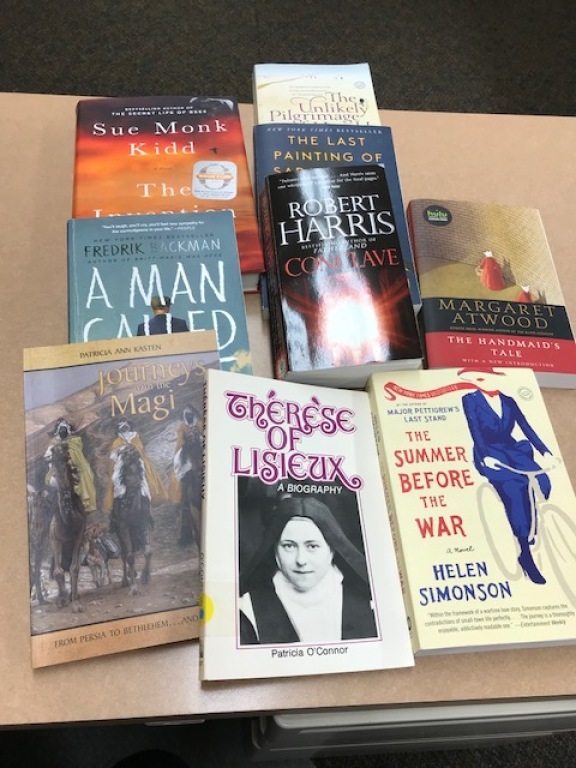 Some of the books selected for this year include: The Handmaid Tale, Small Great Things, The Last Painting of Sara deVos, Journeys with the Magi, The River of Doubt, Conclave, Therese of Lisieux, The Summer Before the War, and Legends and Lies-The Real West. You are encouraged to call one of the coordinators for more information. ALL ARE WELCOME!